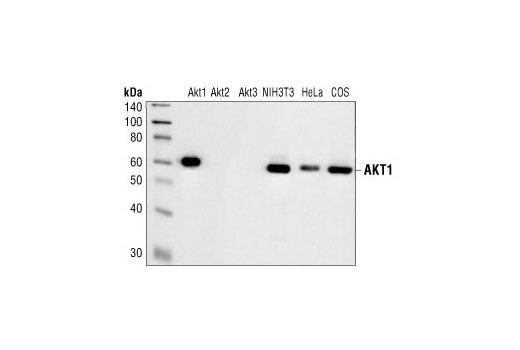 Western blot analysis of Akt1 (lane1), Akt2 (lane2) and Akt3 (lane3) recombinant proteins, and extracts of NIH/3T3, HeLa, and COS cells, using Akt1 (2H10) Mouse mAb. The Akt1 isoform specific (2H10) Mouse mAb detects endogenous levels of Akt1, regardless of its phosphorylation state and does not cross-react with Akt 2 and Akt 3. Monoclonal antibody is produced by immunizing animals with a synthetic peptide. Antibody is purified by protein G affinity chromatography. Three mammalian Akt isoforms have been identified: Akt1, Akt2, and Akt3. Akt2 and Akt3 have 81% and 83% identity in amino acid sequences with Akt1, respectively (18). Vanhaesebroeck, B. and Alessi, D.R. (2000) Biochem J 346 Pt 3, 561-76.